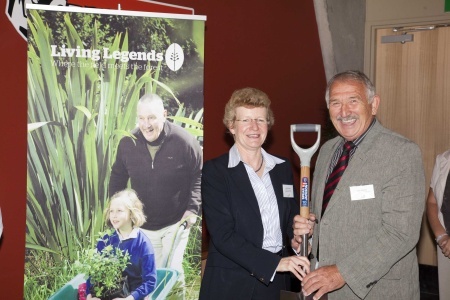 Living Legends volunteers, and Rugby Legend Tane Norton, planted 10,700 native trees at Ōtukaikino Reserve near Christchurch over our three year planting programme. Ōtukaikino Reserve is a 13ha freshwater wetland reserve to the north of Christchurch – at the southern end of the northern motorway. It is one of the few remaining original wetlands that were once common around Christchurch. A boardwalk taking approximately twenty minutes meanders around the wetland, through tall raupo, flaxes and grasses. Sitting areas are placed along the way. Ōtukaikino is significant for Te Runanga o Ngai Tahu, as it was once used for burial preparation and is designated a Wai Tapu site. The water, vegetation and mud were used by Tohunga (priests) for embalming purposes. 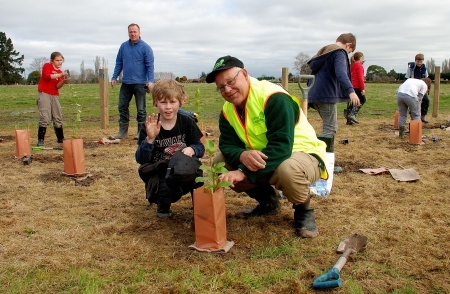 The Department of Conservation, in partnership with Lamb & Hayward Funeral Directors and Tuahuriri Runanga, is restoring this wetland reserve by the gradual planting of living memorials – native trees and plants – donated by Lamb & Hayward, to commemorate each funeral organised by the Company (at no cost to the client). Living Legends is proud to have been able to bolster their effects through the planting of 10,700 natives over the last three years and will continue to oversee the maintenance of this planting project in conjunction with the Department of Conservation, who will care for it for years to come. You can stay involved with the planting site by joining the Friends of Otukaikino who meet on the first Saturday of every month to maintain the plantings. Born in Waikari, North Canterbury, Tane started playing rugby at the Methven Rugby Club, later moving to the Linwood Rugby Club in Christchurch. Tane vividly remembers his father buying his very first pair of rugby boots. In 1969 he first won a place in the New Zealand Maoris, then later secured a spot in the Canterbury team. After appearing in the New Zealand trials in 1970 and 1971 he was selected for the All Blacks against the 1971 Lions, beginning a run of 27 consecutive test matches. Tane toured with the All Blacks, he played in Australia, England, Ireland, Scotland and South Africa. Tane’s greatest success was captaining the All Blacks to victory against the 1977 Lions. Tane also played in and captained the New Zealand Maoris between1969-75. In all Tane played 197 first class games, including 82 for Canterbury and 61 for New Zealand. Tane was the most capped All Black from Canterbury when he retired. Tane also held the record for being the oldest All Black Captain at 35 years and 136 days old! After retiring from playing he remained actively involved as a coach and administrator with the Linwood club. He was elected as NZRU Vice President in 2001 and subsequently again in 2003. As well as these major achievements, in 2006, Tane was made a Member of the New Zealand Order of Merit in the New Zealand Honours List. Tane’s family involvement in Canterbury rugby continues with his four sons playing for Linwood. Together with his wife Jacqui, Tane is happily providing the next generation of Norton rugby players with support from the sidelines. If Tane has one piece of advice for young New Zealanders it would be that whatever sport you play, enjoy it. Be a good sport – be humble when you win and gracious when you lose.